With the 2012 FIA World Endurance Championship closing in fast, Audi engineers have done everything in their power to deliver a Le Mans winner this year, and so they revealed the Audi R18 Ultra 2012, a Quattro all-wheel drive prototype which combines a TDI diesel engine with Hybrid technology. As a matter of fact, the German automaker has built four cars for the 2012 FIA World Endurance Championship (which includes the 24 hour Le Mans race), two of which are relying on hybrid technology while the other two will remain purely diesel powered and will focus more on lightweight technology. The hybrid versions of the R18 have been named "e-tron quattro" and combine an internal combustion engine with an electric motor, with the diesel engine sending its power to the rear axle whilst the front axle is left in the hands of the electric motor. It all sounds pretty familiar; nevertheless the real innovation comes when looking at how the e-tron quattro hybrid system actually works. Basically, during the braking phase, kinetic energy is recovered through the front axle which is connected to a flywheel accumulator that can store energy until a power boost is required. The rear wheels are powered solely by the V6 TDI engine which produces 510 horsepower and interestingly enough, both system can work independently. 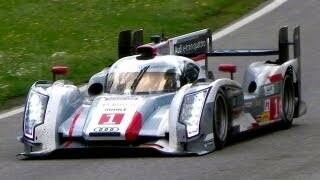 As mentioned before, Audi prepared two other diesel only R18s for this year's FIAendurance competition. These two diesel only variants share the same platform as the hybrids but are much lighter mainly due to the lack of an electric motor. In addition, compared to the 2011 model the new 2012 R18 Ultra received many other improvements, including an innovative transmission featuring a new gearbox with carbon fiber housing. The hybrid versions are set to hit the race track on May 5th during the 6-hour race at theCircuit of Spa-Francorchamps, and will then fight for Le Mans supremacy on June 16-17. That being said, we're quite excited about this year's Le Mans, especially considering the fact that Toyota will also return and participate in this year's 24 hour race after almost 13 years of absence. We're quite excited about their return and we're rather curious to see what they've learned from the F1 competition during the last few years. Whether or not their TS030 Hybrid will be a strong competitor to Audi's R18 Ultra 2012 remains to be seen later this year.